There are four pairs of parallel passenger tracks that run "railroad" north-south through the Frankford Junction complex. The fatal derailment occurred on Track 1, the pair of tracks on the eastern-most side of the yard. The unlucky passengers aboard Amtrak's Northeast Regional Train 188 were headed north on Track 1 when the derailment occurred. Train 188 ran off Track 1 and plowed through an adjacent freight yard. Tracks 2 and 3 have been upgraded to a more modern positive train control [PTC] system in place, a system mandated in 2008 by Congress that is costing the railroad industry billions of dollars. According to a congressional mandate, the PTC systems were supposed to be in place by the end of this year. At one time, it's believed that all four pairs of tracks were outfitted with an automatic braking system put in place during the 1920s by the old Pennsy Railroad. On Track 4, the old PRR safety system is still in place and fully functional. But on Track 1, a key feature of the automatic-braking system is believed to have been removed decades ago. At the time, trains on that track were typically traveling at a speed well under the calculated tipping speed of a train as they approached the curve. NTSB officials, however, have said Train 188 was doing 106 mph on the Frankford Junction curve where the speed limit is 50. The train route and accident site is shown in a 1985 video posted on youtube.com, with the Frankford Junction curve appearing at the 12 minute mark. Safety has always been a paramount concern for railroad management. When Congress passed the Federal Employees Liability Act [FELA] of 1908 it set railroads apart from other employers and substantially increased the financial penalties for injures sustained by workers while on the job. The law is a powerful incentive. Under FELA, railroad workers not covered by workers' compensation are able to sue their employers over injury claims. FELA allows monetary payouts for pain and suffering based on comparative negligence, rather than according to a schedule of pre-determined benefits mandated for non-railroad workers under workers' compensation law. The move to automatically control train speeds dates back to 1922, when the Interstate Commerce Commission issued a ruling requiring all trains to be equipped with automatic train stop technology that would kick in if an engineer failed to respond to a signal requiring that some action be taken to reduce the speed of the train. In 1923, according to a 1976 Congressional report from its Office of Technology Assessment, "Automatic Train Control In Rail Rapid Transit," the Pennsylvania RR "placed in service, experimentally, the first installation anywhere of the continuous inductive cab signal and train controlling system covering 43.5 miles of single track and 3.4 miles of two-track, between Lewistown and Sunbury." This was the first time that "cab signals were used in lieu of wayside signals for operating trains by signal indication," according to the Congressional report. In 1926, the "Cab Signaling System" [CSS] developed by Union Switch & Signal and the General Railway Signal Co. was installed on the Pennsylvania Railroad. The system uses electric signals transmitted within railroad tracks themselves and received by a signal displayed inside the locomotive cab. "Generally, signals did not determine speed restrictions on any given piece of track but rather the distance between trains occupying the same track," Levin wrote. CSS was installed first on the Pennsylvania Railroad's Pittsburgh Division. Next, it was installed by the Pennsylvania RR from New York to Washington and Harrisburg. By the end of the 1930s, the system was in place all the way to Chicago and St. Louis. The early systems had a display in the locomotive cabs that duplicated the railroad signals along the side of the railroad right of way. The display in the cab was also equipped with a warning whistle. The system was designed so that it could be modified to accommodate speed restrictions that the wayside signals did not usually display. According to Levin, the PRR "added features that allowed a 'phantom device' to be installed at critical locations [like Frankford Junction] to cause a signal to be displayed in the cab of a locomotive . . . that was more restricting than the indication on the next wayside signal that would force the engineer to make a brake application not in conformity with the actual track occupancy." This "phantom device" was the safety feature absent on Track 1 Frankford Junction that was believed to have been removed decades later. In 1933, according to the 1976 Congressional report, the "Pennsylvania RR was granted permission by the ICC to convert all its locomotives equipped with the coded continuous train stop system to the coded continuous cab signal system with whistle and acknowledger." 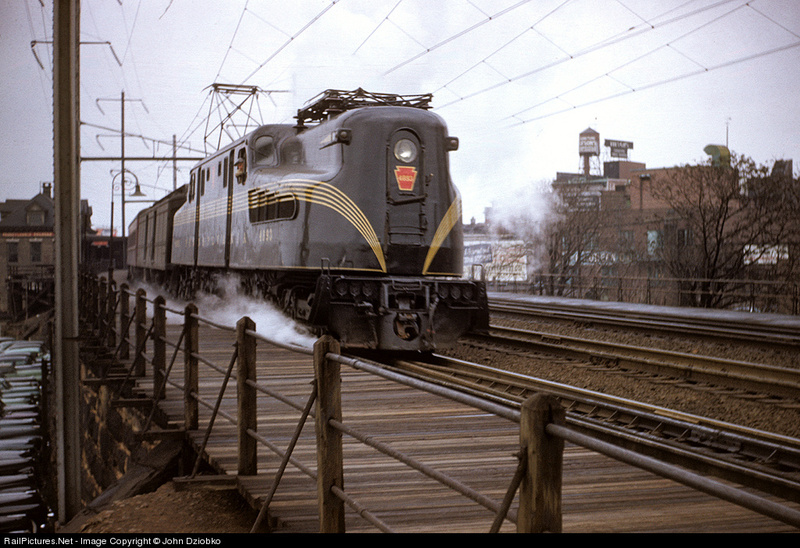 The operation of the cab signal system and the automatic speed control system with the warning whistle was demonstrated memorably in a 1952 promotional film, "Progress On The Rails," produced by the Pennsylvania Railroad, and posted on youtube.com. [Start watching at 4 minutes and end at 8]. In the film, it says that the engineer had six seconds to obey a signal to reduce his speed or the system would do it automatically for him, slowing the train to a dead stop. Even though the old system was perfectly functional, Congress in 1988 passed a law requiring that all trains operating after April 1, 1990 on the Northeast Corridor between Washington and Boston shall be equipped with "automatic train control systems designed to slow or stop a train in response to external signals." But implementation was delayed. It wasn't until 2008 that Congress passed the Rail Safety Improvement Act that required railroads to install much more expensive positive train control systems by Dec. 15, 2015. On May 21, the Federal Railroad Administration issued an emergency order mandating that an Automatic Train Control [ATC] system be installed on Track 1 at Frankford Junction, where the accident occurred. It may have been a classic case of locking the barn door the after the horse was out. In essence, the fix called for the replacement of the phantom signal device believed to have been removed decades ago. At the congressional hearing, according to the Philadelphia Inquirer, Amtrak Chief Executive Joseph Boardman testified that an older safety system was in place on southbound tracks at Frankford Junction, but not on the northbound side where the train derailed because Amtrak did not believe it was needed there. "The notion that an engineer might actually accelerate into the northbound curve was not a circumstance we anticipated," Boardman said in his opening statement. The older safety system was installed on that side of the track shortly after the accident, the Inquirer reported. Christopher A. Hart, chairman of the NTSB, also testified before Congress today about the old safety system. "The area is equipped with automatic train control [ATC], an older automatic braking system," Hart testified, according to a transcript published by the NTSB. "ATC is designed to enforce restrictive and stop signals by applying a penalty brake application to slow or stop the train to prevent or mitigate the results of a train-to-train collision." "The system can be configured to permanently display a restrictive signal that would apply a penalty brake application if the train exceeds a preset speed limit," Hart said. "This particular ATC configuration was in place on the southbound tracks where a greater speed reduction was required; [but] there were no automatic systems in place to enforce the 50 mph permanent speed restriction at the curve on the northbound tracks where the accident occurred." Any changes in safety measures regarding railroads typically must be approved by the federal government. Would the government be liable for approving any removal of the former safety system from the Frankford Junction curve? "This raises very serious concerns as to whether the government has any independent responsibility above and beyond what Amtrak did or did not do," said Heidi Villari, a lawyer at The Beasley Firm. "The original safety measures that were known to be in place were not replaced in time for the accident," she said. "These issues as well as whatever immunities the government may benefit from will have to be resolved in the civil lawsuits to follow." 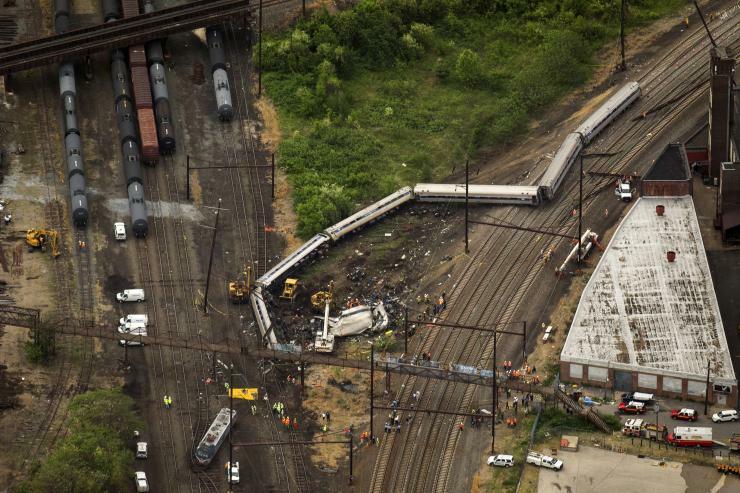 In the wake of the Frankford Junction derailment, civil litigants are limited by a $200 million cap on rail accident damages imposed by Congress in 1997; an amount that local trial lawyers are already saying won't be enough. It may be tough for people who use Amtrak today to appreciate the ingenuity of the technology developed and installed by the former Pennsylvania Railroad almost 100 years ago. The railroad's advertising slogan back then was "speed and security." "Do not think of the Pennsylvania Railroad as a business enterprise," Fortune Magazine wrote in a cover story back in 1936. "Think of it as a nation. It is a bigger nation than Turkey or Uruguay. Its boundaries are wider and it has larger revenues and a larger public debt than they. Corporately also it behaves like a nation; it blankets the lives of its 10,000 citizens like a nation, it requires an allegiance as single as a patriot's." The old PRR safety system is "still functionally sufficient to insure safe operation today," Levin wrote. "Furthermore, it is not subject to "hacking attacks" or attacks on the 'grid'" that might disable the new ATC systems operated by computers, Levin said. "Simplicity is the key and reliability has been its hallmark." Why didn't I read this in the Inquirer? Because you didn't put a quarter in the slot! The mainstream media, as usual, are asking the wrong questions. At the congressional hearing today, officials of Amtrak and NTSB admitted the old safety system was no longer on the north side of the tracks. Instead of asking about the engineer's cellphone, they should have asked why the old system was removed. At the hearing, both Amtrak and NTSB officials admitted the old safety system was reinstalled shortly after the accident, in a classic case of shutting the barn door after the horse was out. No. The ATC system the PRR put in all those years ago did not have the circuitry code needed to give the northbound engineer the approach signal to slow down at Frankford Jct. Amtrak didn't take it out. It was never there. Then why is Amtrak and the NTSB saying they removed an old safety system from that northern track? Are they lying? They aren't saying that. They are saying they added to the old system, not removed it, on the northbound side. This article doesn't quote either Amtrak or NTSB as saying an old safety system was removed from the northbound track. Shouldn't you, as a thorough reporter, have asked Amtrak and the NTSB if that was true? Who would have had the authority to remove it? Maybe the same people who had it put back? Thanks Michael. A reporter's only as good as his sources and Bennett knows his stuff. The story never says Amtrak removed it. It says it was believed to have been removed. Don't know when or by who. Have a source who says he knows it was there. But even if it wasn't after the accidents in Back Bay and Stuyten Duyvil there were studies and orders issued by the federal RR Administration to implement the modification at locations such as Frankford Junction. The question is why wasn't it done. I was a fireman on passenger trains in the early and mid seventies and operated over this territory as a freight locomotive engineer (motorman) from the mid seventies through the mid eighties. Locomotive engineers are required to be qualifed on portions of the railroad over which they operate. While qualifying over this portion of railroad, I do not recall having been instructed that a system such as has been described was in place at this location or any other place on railroad over which I was qualified or did operate. There has never been a place on the territory over which I was qualified where such a system was in effect or, to my knowledge, was installed. Such information would certainly have come up in qualification classes or tests given to qualifying engineers during the time period in which I operated there. Having made probably hundreds of trips over this territory in either direction, I have not experienced effects of such "phantom" electronics. I think, however, that persons with little knowledge of CSS have been confused by another feature of the Cab Signal System wherein, if a signal requiring a STOP (STOP SIGNAL) at Frankford Junction were displayed, the cab signals in the locomotive cab would drop to RESTRICTING as the train (locomotive) passes through the block approaching Frankford Junction. This condition, however, is provided that the last signal before approaching Frankford Junction would be more restrictive than CLEAR signal. If the signal at Frankford Junction were more favorable than STOP SIGNAL or STOP AND PROCEED, then, the cab signals (CSS) would not drop. Certainly there was or would be no effect on the cab signals if the signal previous to Frankford Junction were CLEAR. Not having operated over this territory since approximately 1988-89, My knowledge of this territory has faded and safety appliances may have been added or changed. I speak only to my knowledge of this section of railroad during the time from 1973 to 1989. Tyson is techincally correct as to the sequencing of the signals from Clear on down to STOP. What the modificaton (as on the southbound track) does it replaces the CLEAR with a more resticting indication to force an application even though there may not be a train in front of the one affected. As you say, the bottom line really is......why wasn't the northbound protection into the curve the same as the southbound, especially after the Metro-North incident and the FRA order.